This smaller relative of the Arrau rarely reaches 8 inches in length. 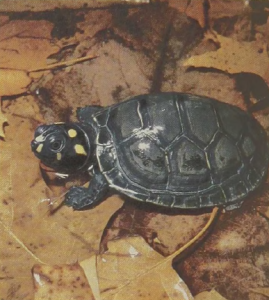 It is a pretty turtle, characterized by bright-yellow markings on the sides of the face. Besides stalking the small invertebrates and fishes which compose much of its prey, this river turtle has developed the curious habit of skimming the surface of the water for the film of small plants and invertebrates that forms in late summer on some of the oxbows where it makes its home. To do this it opens its mouth wide and distends the throat to make a deep pocket. It then drops the head until a thin sheet of water just passes the edge of the lower jaw. The surface tension then pulls floating materials across this weir. As soon as the throat is full the Terekay closes the mouth, blows the water out through the nostrils, and swallows the nutritious remnants.